So what are we thinking? An all ladies brunch with tea, macaroons and pink pastel decor? It is football season so perhaps a co-ed shower? It’d be the perfect excuse to indulge in all your favorite cravings, not to mention the endless amount of diapers you’ll be given. Whatever you decide on countless pictures and video are inevitable so you want you and your bump to look the very best, but let’s face it...we’re in our third trimester we’re tired, we’ve put on a few pounds and sometimes it’s hard to feel our best in our new body. I’m so glad Ingrid & Isabel has so many options that allowed me to feel my best on such a celebratory day. With your bun in the oven being the main attraction, you can choose a flowy sundress for comfort or a fitted dress to highlight your new mama curves. but blue doesn’t make me feel as good as black does . . . so black it is! It’s your baby shower and I say wear whatever makes you feel your best. 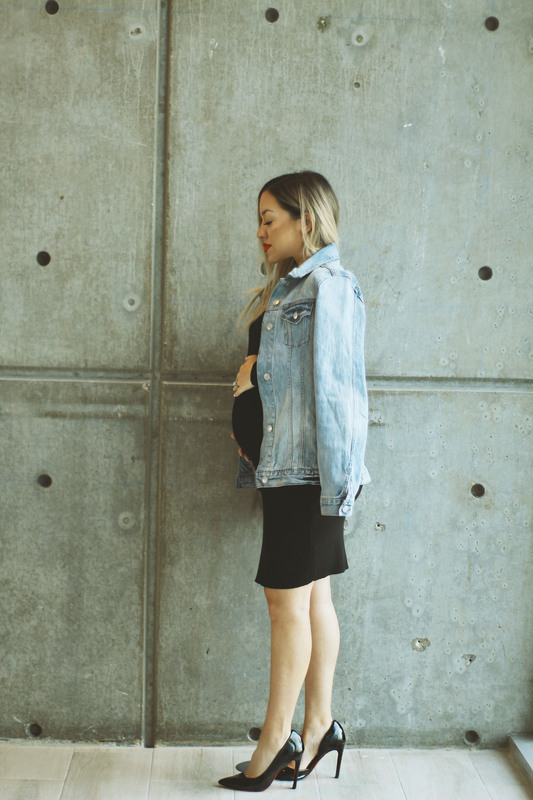 I paired my dress with Ingrid & Isabel’s infamous “Mama” Denim Jacket. In the wise words of Regina George’s mom, “you are NOT a regular mom, you’re a cool mom.” I felt amazing, confident and comfortable throughout my entire shower. The material was breathable, gave me full coverage and highlighted my cute little bump. The jacket made me feel like “me” , a huge plus when it came to choosing the right outfit. Whether you decide on boho chic or a downtown edgy look, remember it’s okay to still be you. Let the pressure roll off your shoulders. You did it mama! You’re in the home stretch and you’re going to look gorgeous in whatever you decide to wear on this joyous occasion. Shop all my favorite Ingrid & Isabel products below. One of our most requested items ever is back in stock! This light wash denim jacket is perfect for any mama who wants to let people know she's part of the club. Perfect as a gift or for pregnancy announcement photos. designed for all to enjoy! This soft and comfortable long sleeve maternity bodycon dress uses side pleats to create a perfect fit with no excess fabric along the sides.